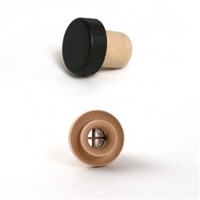 This black 2-piece molded rubber spout is great for everyday pouring from both olive and specialty oils and vinegars - take the two sections apart and insert the spout into the neck of the bottle - then place the black cap on top. Cap protects against oxidation - perfect! This self closing silver pour spout fits into our oil and vinegar bottles. Natural cork bottle insert keeps oils or balsamics where they belong – in the bottle, until you pour them. It helps you control the amount when pouring your precious olive oils and balsamics. This versatile spout is compatible with all of our 200 ml, 375ml and 750ml and is dish washer safe. NOTE: Not compatible with 60ml sampler bottles. This self closing burgundy pour spout fits into our oil and vinegar bottles. Natural cork bottle insert keeps oils or balsamics where they belong – in the bottle, until you pour them. It helps you control the amount when pouring your precious olive oils and balsamics. This versatile spout is compatible with all of our 200 ml, 375ml and 750ml and is dish washer safe.